NEW LISTING Property 001 : The possibilities for this unique property are endless! The land is all flat and useable with good soil and many large Live Oak trees. Currently, it is used as a permanent residence and is nicely outfitted for horses including a lighted arena, 40’ x 60’ barn w/6 stalls and six 40’ partially covered runs, and tack room. The main home has been recently renovated including 2 new HVAC systems, lovely pine flooring and new bathrooms. The “Cantina is a quaint 1BD/1BA guest cabin with large screened porch and a beautiful patio under the oaks. There’s ample room for 2-3 more homes on the property to use as income producing vacation rentals. An additional septic and extra water meter are already in place and ready for another home. A private water well on the property is used for watering the animals and lawn irrigation. Call Shawn to schedule your tour today! NEW LISTING Property 003 : Over 30 acres of remote hunting property in Real County at an affordable price. Several blinds and feeders are strewn about and there are ample game trails and hiking trails for the outdoor enthusiast. Hill Country views and a hunter’s cabin complete the package. NEW LISTING Property 004 : Attractive and well-built home situated on two city lots in the quiet town of Barksdale, TX. This 2 BR/1 Ba is close to restaurants, schools, and the cool and calm waters of the Nueces River. A wide-open yard with lots of beautiful trees is large enough to accommodate a workshop or pets. Owners can enjoy the freedom of no HOA or property restrictions. NEW LISTING Property 005 : At over 11 acres, lot 84 is one of the largest lots in Canyon Oaks. 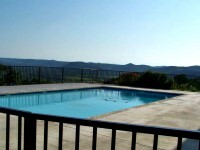 It offers stunning views of the Frio River Canyon and water and electricity are available. It has road frontage on two sides. Owners will have the use of a private park on the banks of the Frio River just upstream from the Kenneth Arthur Crossing. NEW LISTING Property 006 : This 6 acre lot offers stunning views of the Frio River Canyon and a subdivision reserve area with a small pond. Water and electricity are available. It has road frontage on a caliche subdivision road. Owners will have the use of a private park on the banks of the Frio River just upstream from the Kenneth Arthur Crossing. Property 007 : Situated on a corner lot in the Concan Country Club, this home features a U-shaped design that creates a beautiful, private courtyard housing a pool, cabana/kitchen, fireplace, BBQ pit, half bath, and plenty of covered patio area. The unique floorplan includes 2 bedrooms/baths that are common to the main house and two bedrooms/baths with private entrances via the courtyard. Interior finishes include granite, stained woodwork, rock accents, and ceramic “wood look” tile flooring throughout. Storage space abounds with several locking “owners closets” and there are private garages on either end of the home. This home enjoyed a successful first season of nightly rentals in 2018. It’s tastefully furnished and all furnishings will convey! Property 008 : Enjoy Million Dollar views from this 1.18 acre lot in Concan!!! There is a nice amount of flat, cleared area for your building site with breathtaking easterly views. This lot is in the Valley Vista Community, located between Garner State Park and Concan, TX. Owners enjoy a central water system, underground electrical and phone service, fiber optic cable for fast internet, 3 gated rock entrances, a hilltop clubhouse with pool, a park area with pond for fishing and picnics and a 35 ac. wilderness area for hiking and exploring. Property 009 : Quality is evident throughout this 5BD/4BA/2HB home on the Frio! It was built as the owner’s private retreat and has never been rented, though it can be placed in a rental pool. The wood work throughout is stunning with hand crafted mesquite floors and staircase. Doors are all solid wood and custom cabinets have the soft close feature. The kitchen is a chef’s dream with high end appliances and a HUGE island. Split floorplan with 4 bedrooms along one wing and master on other side of home. A large loft area with full bath is perfect for the young folks in your group. All ages will enjoy the beautiful back courtyard area with outdoor fireplace and kitchen area with views of the river and the hills. The Frio River frontage is the cherry on top! This is a rare opportunity to own a generous amount of Frio River front property in the heart of Concan and Heartstone is THE place to be in Concan! REDUCED Property 010 : AXIS! Now that I’ve got your attention you need to come take a look at this 31 acre piece a stone’s throw from Hwy 41. You may as well call this area Axis Alley as it’s known for the exotics. With easy access via an easement road it’s set back from the highway just enough to provide the privacy you desire on your own hunting land. Electricity is nearby, topography is almost level with a slight slope, plenty of browse provides sufficient cover for wildlife, NO restrictions, need I go on? 37+ acres adjoining has sold. You’ll be kicking yourself if you let this one pass you up, so call today! PENDING Property 011 : Are you ready to hunt and enjoy the incredible long views of the Hill Country right from your own porch. This 22 acres is located on one of the highest peaks in Real county, right off RR 336 about 1 mile off blacktop with plenty of road frontage on a deeded easement road. The land is covered in cedars with several species of oak and mountain laurel. It is home to whitetail deer, turkey, hogs, exotics and especially aoudad to name a few. REDUCED Property 012 : A nice 5 acres conveniently located a few miles north of Leakey off highway 83. A metal building has been constructed and completed on the exterior, inside has been left a shell for the buyer to finish out to their liking. The building sits behind plenty of cover from highway for privacy. This 5 acres borders a big ranch to the back and gives the owner that big ranch feel. Many oaks and cedar give the building the privacy you will need to enjoy the wild game, the views of the hills behind or the views from the front are spectacular. Property has access to a shared water well, electricity is available. REDUCED Property 013 : Here is a place for the whole family. Dont let this get away, close to the west prong of the Frio. So enjoy the Frio or get in the blind and enjoy some hunting. Unless you want to just enjoy nature at its best, This place is gret for hiking. Many hogs, whitetail, all sorts of exotics along with aoudad call this area home. This has 1 bedroom 1 bath with kitchen/living area open. Property 014 : Enjoy the phenomenal views from this 1+ acre lot in Concan, Texas. It fronts a paved road and is a perfect location for a vacation home. Nightly rentals are allowed in this area. Owners will have access to the HOA park to picnic and enjoy the Frio River. There is a central water system and electricity is available. This tract is centrally located to all of the happenings in Concan. The golf course is minutes away and restaurants, Uvalde, Leakey, Utopia & Garner State Park are all just a short drive. REDUCED Property 015 : LOCATION LOCATION LOCATION!!!!! Take a look at this unrestricted 6.5 acre tract of land in Concan, Texas! With over 500’ of US Hwy. 83 frontage, great visibility, and gentle topography it is well suited for many uses. Electricity runs the length of the front (east) of the property. There is a fence across the back side and many large oak trees that would love to be liberated from the cedars. REDUCED Property 016 : A great place to make your family getaways memorable. So don’t wait long, A place that is very wooded, deep draws, many building sites with enormous views. Hunting is allowed,and is the gateway into the subdivision from the large ranch next door. No water on property, but nice owners park at the spring feed pond about 1 mile away via easement road. Property 017 : You can enjoy peace & quiet on this secluded 12.77 acre lot that is in the heart of Concan! It is located in a rarely traveled area and backs up to a large ranch. Owners will have access to the Frio River via a private owner’s park area near the Frio Country Store. Power and water have not been extended to this area and price is low to reflect this. PENDING Property 018 : A ready to hunt property with end of road privacy. Property is accessed through private easement road, behind two locked gates. Cabin is a true hunters cabin, no utilities at all, but wired for generator use. This place borders a huge ranch with low fencing on entire east fence line. Property starts off flat and partially cleared, with a gentle slope being wooded all the way to dry creek. Hunting lanes have been cleared and ready to be hunted. Among the list of animals being harvested from this place are whitetail, hogs, axis, sheep & other exotics. So don’t wait to long, still sometime left to hunt. REDUCED Property 019 : This beautiful 15 acre parcel of Hill Country paradise would make the perfect location for a get-away cabin OR a dream home! It is extremely private, being located at the very back of a 1,000 acre subdivision. The roads are a combination of asphalt and all-weather caliche, providing easy access for any type of vehicle. Electricity runs along the front of the tract and the rear of the tract fronts on seasonal “Deer Creek” and fencing is present on the other two sides of the property. Numerous oak trees are scattered about the property along with mesquite, cedar, huisache and other vegetation. The property is flat with a slight slope down toward the creek, but mountain views are present in all directions. Property 020 : Situated at one of the highest points in Concan, these three lots are unique in that they boast road frontage on two sides, allowing flexibility for where to locate improvements. Buy one, two or ALL THREE! Water & electricity are available and nightly rentals are allowed here. There’s a beautiful Frio River access park nearby for owners use. Property 021 : Endless possibilities await the new owners of this highly desirable, unrestricted, river front property in Concan. It fronts on CR350 and Camp Riverview lies to the north side of the property. There is a charming, original block home plus a very nicely remodeled double wide mobile home that is currently used for nightly rentals. There’s plenty of room for additional development or, you might want this to be your own personal Frio Retreat or homeplace! REDUCED Property 023 : Curious about what it’s like to live outside the city life? You will love this 3BD/2BA! It has everything to offer for a great vacation home or even a family looking to relocate. The kitchen, dining & living areas are open to one another. Stainless appliances and granite countertops grace the kitchen and double French doors lead out to the back yard. The living room has a lovely built-in entertainment area and coffered ceilings. The master suite has a large walk-in closet and a bathroom with garden tub and separate shower plus double vanities. The utility room sports lots of counter space and room for an extra fridge or freezer. All of this is nestled beneath giant pecan trees on 2 unrestricted acres with views of the hills! Garner State Park and the Frio River are both nearby. Property 024 : Located just a half mile off Hwy. 127 in Concan, this tract has an excellent location conducive to enjoying all that Concan has to offer. It’s just minutes from Neals Café and the Frio River. The land is level with deep soil that supports numerous hardwood trees and slopes gently to seasonal Brushy Creek on the back side of the property. Electricity runs across the entire front of the parcel at the road. There is no HOA. Property 025 : Enjoy Concan living at its finest in this beautiful and spacious 4BD/4BA home on nearly an acre! Light, neutral colors contrast with gorgeous, stained woodwork throughout the home and ceramic tile graces the floors. Many large windows bring the outdoors in and provide an abundance of natural light. Ceilings are all high and the living room is accented with a large, wood vaulted ceiling. The sparkling pool and covered back patio w/outdoor kitchen look out toward a beautiful mountain view. An attached “party garage” is cleverly integrated into the backyard area for maximum entertaining space. There’s a Frio River access park for owners RIGHT ACROSS THE STREET plus another park near Kenneth Arthur Crossing. This home is currently a very successful nightly rental property. Sells FURNISHED. Property 027 : A 2bdrm/2bth 2 story home Beautiful Hill Country Home located in the desirable Texas Hill Country. Nestled on 23.79 acres. Inviting front porch with beautiful views. This home boasts cathedral ceilings in living, many windows taking in the gorgeous outdoors, open concept kitchen into dining area. Once you discover the covered porch, you will not want to leave. The tract is dominated by high hills, plateaus and distant views with many beautiful wooded sites. This area is very private, neighbors are a ways away, many game run this part of the Texas Hill Country. This home has so much character inside and out. Must see! Property 028 : Several 5 +/- acre tracts located north of Leakey, very wooded, with views and secluded. Electricity is available to 3 tracts, they are all fairly close to the Frio. These tracts can be used for hunting, camping or used for a fulltime resident. Property 030 : Swim and picnic on this beautiful waterfront property that's located on the crystal clear Frio River. It’s in a very quiet and secluded location, yet just minutes from downtown Leakey. Electricity runs across the front of the property and there is a septic on site. Call today for an exclusive showing! Owner is a Licensed Real Estate Broker. Property 031 : There are very few lots left in the highly sought after Heartstone Subdivision in Concan. Here is your chance to own a lovely 3/4 acre lot with beautiful oak trees and wonderful visibility. There are two river access parks available for owner’s use and both are an easy walk from the lot. Terrain is level, underground utilities in place, paved/curbed streets and a gated entrance enhance the desirability of this lot. Homes built here may be rented on a nightly basis. Property 032 : There are very few lots left in the highly sought after Heartstone Subdivision in Concan. Here is your chance to own a lovely 3/4 acre lot with several large oak trees and wonderful visibility. There are two river access parks available for owner’s use and both are an easy walk from the lot. Terrain is level, underground utilities in place, paved/curbed streets and a gated entrance enhance the desirability of this lot. Homes built here may be rented on a nightly basis. NEW LISTING Property 034 : A nice 3BD/2BA Solitaire home sits upon this expansive 5.97 ac property. All bedrooms have walk-in closets and there is abundant storage throughout. A screened porch looks out over the property and the owners have spent many enjoyable hours here watching the deer and wildlife. HUGE pecan trees and several varieties of oak cover the property. There is a large garden area that is high-fenced and supplied by it's own water well and electric meter. A 20x20 carport adjacent to the house provides covered parking. A 2400 sq. ft. metal building on a slab contains two more covered parking spaces, a bunkhouse w/kitchen & bathroom plus a workshop area. If you can tear yourself away from all this property has to offer, there is the finest, widest, deep water Frio River park in the area just across the street for your enjoyment! NEW LISTING Property 035 : “Blue Nest” is perched on a high bluff above the Frio River with large windows to capitalize on the views of the river and surrounding hills. It’s a rare opportunity to own a generous amount of Frio River front property in the heart of Concan. The 6BD/6BA/2HB home is designed to comfortably accommodate all your friends and family. It lives BIG with spacious rooms and lovely outdoor patios, decks and a grassy yard at the river’s edge! Storage abounds and there are a number of locking “owner’s closets” which allow for harmonious use between owners and renters. All furnishings, fixtures and appliances will convey with the sale. Just bring your clothes and spend the summer on the Frio! REDUCED Property 036 : This 13.9 acre property has it ALL, starting with 500’ +/- of the beautiful Frio River! There is a comfortable, brick main home of approx. 1900 sq. ft. that has had some recent updates PLUS 5 guest cabins currently used to produce income. Visit http://riverstonecabins.com for more information on the rental business. This all sits at the base of a beautiful mountain and looks toward the cypress-studded river bank. There are several nice outbuildings including a very large metal workshop on a slab. It is peaceful and beautiful here with views and wildlife galore. Perfect family compound or continue as an income producing property. You must see this one! Property 037 : Tract 35 is located on the north side of the Valley Vista subdivision and features an interesting rock outcropping. It’s a perfect lot for a multi-level home with a “walk out” lower floor. The views are spectacular! The Valley Vista Community is located between Garner State Park and Concan, TX and offers 1 to 9 acre tracts. Owners enjoy a central water system, underground electrical and phone service, 3 gated rock entrances, a hilltop clubhouse with pool, a park area with pond for fishing and picnics and a 35 ac. wilderness area for hiking and exploring. Property 038 : A 5 acre tract lots of cedars and a few oaks mixed in. This subdivision is located north of Leakey about 10 miles. A place to enjoy with the whole family, build a cozy cabin or just enjoy camping. Also enjoy the cold spring feed pond, which is down road about 2 miles away. Property starts off gently, then drops off toward the back, makes a great hunting place. Property 039 : Unimproved 10-acre tract with lots of potential and minimal restrictions. Electricity runs across the front of the tract. No water well. No survey (plat provided). Hunting is allowed. This tract has approximately 300' of private road frontage, with varying terrain that includes approximately 2 acres of flat land in the bottom with the rest of the tract steadily sloping up to the top of the hill making an excellent vantage point. Lots of cedar and brush cover waiting to be cleared with trails. Priced to sell and easy to show! Buyer to independently verify road frontage and flat land; all totals are estimated based on aerial photography and maps. Property 040 : Your search for a “do it all” vacation property could end right here! Enjoy the sparkling cool waters of the beautiful Frio River from the gently sloping banks of this 17.6 acres. Although secluded, this Hill Country gem is located mere minutes from downtown Leakey shopping. Native and exotic game such as whitetail, axis, turkey and dove abound with plenty of browse including several species of hardwoods, persimmon, agarita, mountain laurel, and juniper. Several potential building sites are provided by the level terrain, and electricity is close by. NEW LISTING Property 042 : If you are ready to build your vacation home near the Frio River, this may be the perfect spot. This gorgeous tree-covered lot is over 2 acres, comes with outstanding Frio River access and all utilities in place. The property is high fenced along the front with several potential building sites. Laid-back restrictions allow for manufactured homes or RV's, and annual dues are only $36/year! NEW LISTING Property 043 : Just what everybody is looking for in RIVER FRONT TRACTS…..gentle walk into the Frio. Easy access from paved county road, huge oak trees, well, and electricity in place. Centrally located close to Leakey and Con Can with Uvalde not far away. Places like these don’t come on market very much, especially in this area. Just a few minute float into Garner State Park. NEW LISTING Property 044 : This lovely stone home is inside the Leakey city limits and within walking distance of the school. It features 4 bedrooms & 2 bathrooms, 2 living areas + a formal dining room w/custom buffet and built in display and storage cabinets. An over-sized, attached 3 car garage enters into the utility room. A handy built in office/desk area is just off the kitchen. There is abundant storage and custom cabinetry throughout. The master suite opens onto the large deck and has views of the heated, in-ground pool and hot tub. Deck area is also accessed from the living room. A poolside cabana/grill area plus fenced back yard complete the package. PENDING Property 045 : Over 7 acres in Uvalde County not far from Concan, TX with easy access and electricity available. Property is virtually unrestricted, so hunting, manufactured homes, RVs, and horses are allowed. Numerous trees are strewn about the property. All usable land located at the corner of two backroads. 4x4 not needed but road is a little bumpy. Priced to sell! REDUCED Property 046 : Just listed! 10 acres of beautiful tree-studded country with an existing Quonset hut finished out with two bedrooms, one full bathroom, kitchen, and living area. An attached carport leads to an exterior Bonus Room for additional guests or game room. A short walk from the main home sits unfinished guest quarters that could easily be finished out with the new owner's preferences in counters, cabinets, appliances and flooring. A 30x40 workshop and a storage building are also part of this great bundle that would be ideal for a nightly vacation rental or permanent residence for someone looking to reside in the beautiful hill country. HUGE REDUCTION Property 047 : Frio River frontage, gorgeous views and a spacious and tastefully updated brick home are the focal points of this 53+ acre property. The home boasts a huge living area with beautiful hardwood floors and a massive double-sided fireplace. There are 2 master suites and a 3rd bedroom and bathroom on the other side of the house. An enclosed and attached garage, separate metal garage, barn, small guest house and in-ground pool with a rock patio all the way around and a huge rock fireplace, the complete the package. There is frontage on both RR336 and a paved county road lending commercial possibilities to the mix. The rolling, oak-studded land is unrestricted. Property 058 : This 160 acre ranch is perfect as a residential property with a 1,600 sf fully furnished ranch style home and a 3 acre lake behind the house. This property would also be a great weekend retreat where hunting is allowed and fish can be caught from the pond. Finally, this property could be easily divided into 50-60 acre lots with a mile of Highyway 173 frontage. Watering Hole Ranch is conveniently located about a 5 minute drive north of Bandera and a 15 minute drive south of Kerrville. There is low fencing around the perimeter of the property, and there is a mixture of flat land and rolling terrain with plenty of hardwood trees throughout. Approximately 85% of the cedar has been cleared. The property is currently under ag. exemption. The ranch has three barns used for hay storage and farm implement storage. This 160 acre property can be cut into tracts to meet your needs. Please call listing agent for more information or for a showing. Owner/agent. Property 059 : Lot 2 is located on Highway 173 approximately 6 miles north of Bandera. This lot is 8.26 acres and can be used for residential or commercial purposes. There is county road access to the lot right off Highway 173. This lot would be a great homesite with large trees and level to rolling terrain or it would be great for a business with Highway 173 frontage. For more information go to: www.wateringholeranch.com and click on Happy Hollow Lots. NEW LISTING Property 060 : Welcome home to this updated 3 BR/2 ba home on 2.24 acres! This lovely 2-story home features a bedroom, full bath, kitchen, living, dining, laundry room and office downstairs, with an additional two bedrooms and full bath upstairs. The flooring and kitchen have been recently updated and the stylish farmhouse feel is evident throughout. Outdoors you will find a large 2-car garage with workshop, covered back patio, and abundant oaks providing shade and privacy. Best of all, FRIO RIVER ACCESS at a private and beautiful homeowners park. Sellers are offering a $5,000 central heat/ac allowance. Property 060 : Lot 4 is located on Happy Hollow Drive off Highway 173 about 6 miles north of Bandera and 17 miles south of Kerrville. This is one of the largest lots at 11.25 acres and borders the Watering Hole Ranch to the south. This lot would be a great homesite with large trees and level to rolling terrain. Electricity is available but will need a well and septic. Very quiet and secluded area. For more information go to: www.wateringholeranch.com and click on the Happy Hollow Lots icon or call Kathy at 830-591-6067. Property 061 : Lot 5 is 7.10 acres and is located on Highway 173 approximately 6 miles north of Bandera. This lot has large trees and rolling to flat terrain and will make a great homesite. Electricity available but will need septic and well. Happy Hollow Drive is a paved county road off of Highway 173. For more information go to: www.wateringholeranch.com and click on Happy Hollow Lots. Owner is a LREA.